AdRoll is a leading performance marketing platform with over 35,000 clients worldwide. Its suite of high-performance tools works across devices, helping businesses attract, convert, and grow their customer base. The company is home to the world’s largest opt-in advertiser data co-op, the IntentMap™ with over 1.2 billion digital profiles. AdRoll’s goal is to build the most powerful marketing platform through performance, usability, and openness. 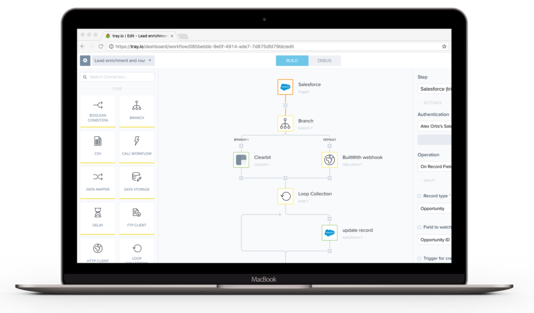 Like many B2B companies, AdRoll relies on Salesforce, its customer relationship management system, to track and manage sales opportunities. However, how AdRoll uses some of the fields within Salesforce is unique. Brendon Ritz, marketing operations lead at AdRoll, explains: “We use the opportunities object in Salesforce as an account object and that lets us track ‘advertisable’ web properties as individual opportunities.” AdRoll then uses the Salesforce account field to denote the company that owns the web property. While a standard integration is available between Clearbit, the company that AdRoll uses to provide the website rank and other enrichment data, and Salesforce, that integration couldn’t support AdRoll because of how the company uses the opportunity field. AdRoll needed an easy, fast way to accurately refresh the website rank for approximately 650,000 Salesforce opportunities on a weekly basis. Based on a referral from Clearbit, AdRoll turned to Tray.io to help it solve its integration problem. Tray is an API integration platform that uses no-code configuration to empower business people to integrate and automate processes. Tray helped Ritz create the integration, then test and deploy it. The result is a flow within Tray that runs each weekend and checks every opportunity website in the Salesforce database against the Clearbit database, refreshing and enriching the data if needed. AdRoll previously used custom code to take data from BuiltWith and put it into Salesforce, but the code didn’t include the logic needed to identify and remove attributes that were no longer being used. This led to out-of-date information in AdRoll’s Salesforce opportunity records and, consequently, unhappy sales teams. Ritz used Tray to rapidly create an integration between BuiltWith and Salesforce that correctly refreshes the data and removes it when attributes are no longer being used.